CodeNEXT Draft 3 incorporates some minor improvements over Draft 1, Draft 2, and our current land development code. However, the latest draft still falls far short of the changes that are needed in order to address affordability, transportation, and social equity in a meaningful way. Draft 3 will continue to push new development into gentrifying areas of the city, exacerbate our housing shortage, increase rents, and encourage environmentally damaging sprawl because it does not increase the supply of market rate or affordable housing enough in high opportunity areas such as central and west Austin. The proposed zoning map does not tackle Austin’s affordability crisis, is worse than the previous map included with Draft 2, more affordable missing middle housing is still almost entirely missing, and proposes that approximately 26% of the city would be exempt from CodeNEXT zoning, including Hyde Park. A comprehensive city wide plan that includes all neighborhoods should be implemented as part of CodeNEXT in order to help get on track to fixing our city’s problems. Parking requirements are still too burdensome for businesses and residential uses. Minimum lot sizes remain too high. “Compatibility” requirements are not removed. The density bonus program does not apply to the entire city and will result in almost no new affordable units within the interiors of our neighborhoods where it’s needed most. There are some areas of incremental improvements such as removing parking requirements for ADUs, parking reductions along corridors, and the elimination of site plan requirements for up to 6 units. However, these minor improvements are far outweighed by the barriers that remain from our current exclusionary land development code. For example, exempting site plans for up to 6 units is a step in the right direction, but there are almost no properties in the entire city zoned for up to 6 units for this improvement to make any difference. Draft 3 is the start of a land development code that has the potential to be better than our current failed land development code. However, CodeNEXT also has the potential to lock us into a new land code for the next 30 years that’s essentially not much different than what we have now. We need to make CodeNEXT substantially better. Friends of Hyde Park is hopeful that the Planning Commission and the City Council will make the necessary bold changes needed to make real progress. Our neighborhood association, Friends of Hyde Park, is the largest neighborhood association in Hyde Park with 415 current members (approximately 50% renters and approximately 50% homestead homeowners) and has more participation of residents in our votes and stakeholder processes out of any other neighborhood association in the area. The following are some of the initial changes that should be adopted to move CodeNEXT in the right direction. Density Bonus Program Should Apply to All Zones (R2 and R3) – R2, R3, and all other zones should also be eligible for conditional density programs (“density bonuses”) that would embrace below-market affordable homes. Austinites of all income levels should have access to high opportunity areas such as the interiors of our neighborhoods. We should not be segregating lower income individuals and families to only be allowed along high traffic major roads or corridors. The density bonus program should not be used as a token program to say we did something to add deeply affordable housing when in reality it won’t accomplish much on the ground unless it applies city wide. Density Bonus Program Needs More Incentives to Get More Affordable Housing – Density bonus programs should provide more incentives. Otherwise, developers and homeowners may simply elect to build to base zoning and we will not get affordable housing built. Several incentives should be provided such as increased height, greater FAR, reduced setbacks, and greater density instead of only allowing just one option. “Compatibility” For Height Should Be Eliminated Entirely – “Compatibility” requirements reduce the height and density of properties adjacent to single family home uses. This barrier reduces the amount of housing on adjacent properties and makes new housing impossible to add in the areas where it’s needed the most such as along activity corridors like Guadalupe St that have shallow lots next to single family homes and within neighborhood interiors. If a property is zoned for specific height and density entitlements, then it should receive those entitlements, otherwise there is little to no advantage to their zoning. Allow “Compatibility” To Be Waived by Adjacent Property Owners – Allow property owners to determine if the height of buildings next to them is important and it not, allow them to waive the height restrictions caused by compatibility requirements for the adjacent property. Allow Setbacks to Be Waived By Adjacent Property Owners – Allow individual property owners to determine if setbacks are important to them and if not, allow them to waive the setback requirements for the adjacent property. Properties Up to 10 Units Should be Exempt from Site Plans – Smaller missing middle housing is some of the most affordable housing types available. Exempting up to 6 units from site plans, which are one of the most expensive barriers to this housing type is a good start, but we need to go further. Minimum Lot Sizes Should be Eliminated or Reduced – The minimum lot sizes for housing in R2, R3, and R4 should be no higher than 2,500 sqft or completely eliminated. Using lot widths is enough form restriction and minimum lot sizes are just another barrier to needed housing. ADU Lot Sizes Should be Eliminated or Reduced – The minimum lot size to build an ADU should be reduced to 2500 sqft. Keeping the lot size at 3,500 to build an ADU will effectively be not much different than our current code in existing neighborhoods. R2 Zones Should Include a Single-Family Small Lot Form – “Single Family” use should be reduced to 25′ width and 2,500 sqft minimum lot size. Alternatively, a new form should be added with a 25′ width and 2,500 sqft minimum lot size called “Single-Family Small Lot.” If the ADU min lot size is kept at 3,500 sqft, that would still prevent most existing lots from having more than 2 units in R2. Both attached and detached forms should be allowed. Smaller homes on smaller lots are one of the most affordable housing types. R3 Zones Should Include Triplex Form – Triplexes should be an allowed use. This type of missing middle is still missing within the land code. If 3 units are allowed, then all forms of 3 units should be allowed for more flexibility and a variety of preferences for homeowners and renters. R3 Zones Should Allow 2 Units Within A Single ADU Structure – There should be an option to put two units in the ADU and have the primary structure as a single family structure. Some people may want to live in a single family home instead of a duplex. It would also allow for smaller units in the ADU that would be more affordable while integrating among other single family homes. We should be encouraging a greater variety of housing types. All forms of 3 units should be allowed in the 3 unit zone. R3 Zones Should Allow 2 Separate ADU Structures – There should be an option to allow two separate ADU structures and have the primary structure as a single family structure. Again, all forms of 3 units should be allowed in the 3 unit zone. R4 Zones Should Allow Up To 3 Units Within A Single ADU Structure – There should be an option to put three units in the ADU and have the primary structure remain a single family structure. All forms of 4 units should be allowed in the 4 unit zone. R2 and R3 Zones Should Include a Townhouse Form – Attached townhouses are one of the most affordable housing types because of the reduced cost from shared construction. If we are serious about affordability and bringing down housing costs, then this form will be included in more parts of the city. Eliminate Mandatory Attendance Requirements – Similar to national voter ID laws in their intent, Contact Teams implement mandatory waiting periods or require mandatory attendance at previous Contact Team meetings before a stakeholder is allowed to gain voting rights. These rules are specifically designed as a way to disenfranchise stakeholders from becoming involved in the process and gaining voting rights whenever they would like to participate. Contact Teams often have votes on important matters that are not announced in advance and if an impacted stakeholder does attend a meeting to have their voice heard, they are not allowed to participate because they do not meet these burdensome voting requirements. These requirements guarantee that only a select few incumbent members retain the complete power of the Contact Team to make any decisions, regardless of what stakeholders that attend the meetings would have decided. These requirements favor older, wealthier, and retired individuals and ensure the voting membership of Contact Teams does not resemble the makeup of the stakeholders in the planning area. Require Online Voting – Online voting is easy to securely set up, and would allow easy participation for all stakeholders in the planning area. Many stakeholders work multiple jobs, have children, or do not have the luxury of extra time to attend long meetings. If Austin is serious about getting representative stakeholder input in the planning process, then online voting will be mandatory. Set Up a City Website and Require All Meetings, Votes, and Minutes Be Posted – There is currently little to no way for stakeholders in neighborhoods to find out when or where Contact Team meetings are held. Some Contact Teams meet in complete secrecy without any notice and in a private space not open to the public as a way to disenfranchise stakeholders in the planning area. It should be a requirement for meeting minutes to be posted on the site within a certain time period after the meeting. There is currently no easy way for any stakeholders to find any information about what happened at most previous Contact Team meetings. It should also be a requirement for all votes being taken at Contact Team meetings to be posted in advance to give stakeholders adequate time to get involved and have their voices heard on the issue. Assign A City Staff Member to Oversee Each Contact Team – City staff should be assigned to oversee each Contact Team. The assigned staff member should attend and facilitate all meetings, functions, oversee eligible voter rosters, and take the place and function of current officer positions on Contact Teams to ensure a fair process. If Contact Teams are to continue as officially recognized planning groups within the City of Austin, then the city needs to provide adequate resources to ensure an equitable and representative process. 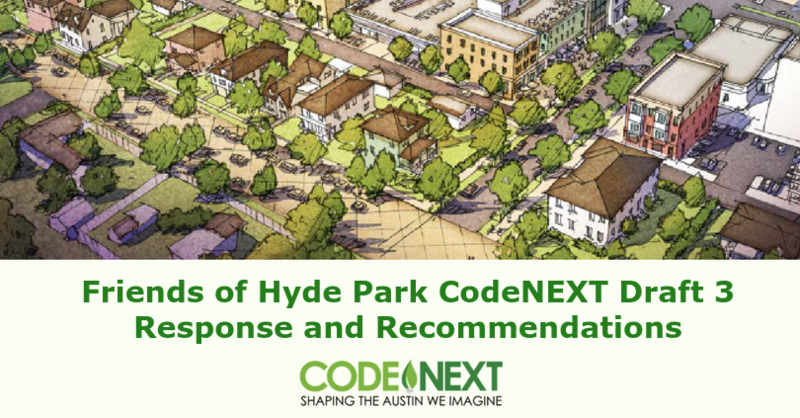 CodeNEXT Zoning Should Apply to the Entire City – No neighborhoods, like Hyde Park, should be exempt from CodeNEXT. All neighborhoods city wide should have a standard set of variables to determine the zoning such as proximity to transit. The entire city should be brought into CodeNEXT zoning. Otherwise, having two land development codes active at the same time will be incredibly burdensome, overly complicated, and difficult to understand for property owners and city staff. Petition Rights Should Be Granted To Property Owners of Legacy F25 Zoned Properties To Request Rezoning During CodeNEXT Mapping – If there are any properties that are proposed to remain zoned under the old land development code (F25 – Former Title 25 properties), those property owners should be given a short time period to request that city staff, the Planning Commission, and the City Council bring their properties into compliance with CodeNEXT zoning before the adoption of the CodeNEXT map. Rezoning properties is a very expensive and time consuming process, which is completely out of reach for the average homeowner or property owner. If those property owners are denied their rights to opt-in to CodeNEXT before the map is adopted, they likely will never be moved into CodeNEXT zoning. This is a very well thought out list of recommendations. The idea of allowing adjacent property owners to waive compatibility is ingenious, as there is no sensible reason why not to allow this, given that in CodeNEXT compatibility only kicks in for adjacent properties. My biggest complaint with the status quo and all of the CodeNEXT proposals is that you can’t do some things even if every single person in the city is OK with them — that’s absurd.